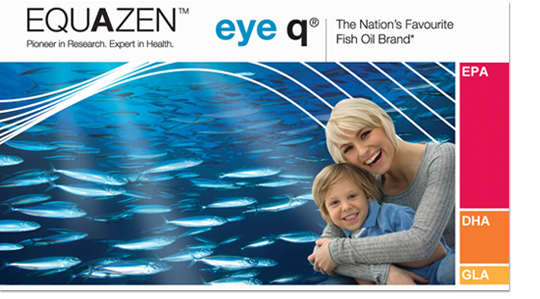 We hope both children and parents will love our Equazen eye q chews. These days we all have to be very careful what we feed our children, so we’ve managed to deliver these strawberry-flavoured capsules without including additives such as aspartame, saccharine, or hydrogenated oils. So all that is in EQUAZEN chews are our naturally sourced Omega-3 and Omega-6 oils, strawberry nature identical flavour, and some basic ingredients to make the capsule shell chewy. Like the EQUAZEN capsules, we advise two chews per day with food. If you are starting supplementation after a long break or for the first time, we suggest a daily intake of six chews for the first twelve weeks, in order to build up the body’s levels of Essential Fatty Acids. Available in pots of 60 or 180 capsules, they can be swallowed whole or chewed. The strawberry flavour helps minimise any fishy smell or taste. Hi-EPA fish oil, Evening Primrose Oil, strawberry flavour, Natural Vitamin E (as d-alpha tocopherol, from IP soya). Capsule shell: gelatin, glycerol, purified water, xylitol, strawberry flavour, powdered cellulose, colour - cochineal. 2 EU recommended daily allowance: 36%. +∞TE = d-alpha tocopherol. Capsule shell: gelatin, glycerol, purified water, xylitol, strawberry flavour, powdered cellulose, colour - cochineal.